Do you happen to know Guenadi N Jilevski? If yes, then please tell him that stealing content is a bad idea. Update. As of Jun, 9 blog posts mentioned here (and in the comments section) are removed from the Guenadi’s blog. Update #2. 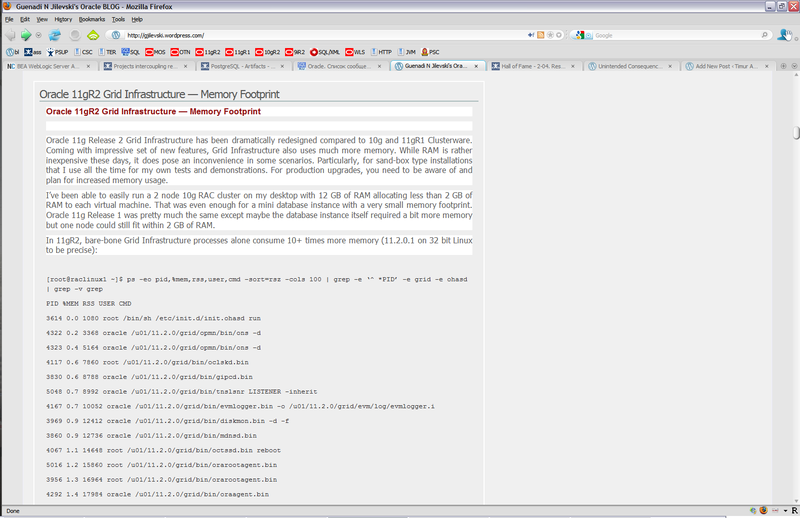 I made a mistake in the original post – the “Oracle 11gR2 Grid Infrastructure — Memory Footprint” is authored by Alex Gorbachev, not Alex Fatkulin. Now corrected. Update #4. Tim Hall supplied a useful link in one of his comments. This entry was written by Timur Akhmadeev, posted on June 2, 2010 at 12:05, filed under Other. Bookmark the permalink. Follow any comments here with the RSS feed for this post. Post a comment or leave a trackback: Trackback URL. Looks like most of his content is nicked. Had a quick scan & most of the stuff is apparently duplicated from elsewhere – several Burleson articles, some from Tim Hall, Arup Nanda, etc. Although occasionally, a word here and there has been changed. Quite a number of his articles were posted December 13, 2009. The content seems to be removed already. I have contacted the author on the LinkedIn and I here is the messages exchange so far. I don’t really have much time to spend on this so I simply suggested to post the comments here on this blog. I see that the content they reference is not available on your blog anymore. Btw, http://gjilevski.wordpress.com/ is your blog. Right? I can’t argue that the content is taken completely from here – http://gavinsoorma.com/2009/06/11g-active-standby/ with slight modification on database name. This is plagiarism when it’s re-posted without author’s consent and link to the source. 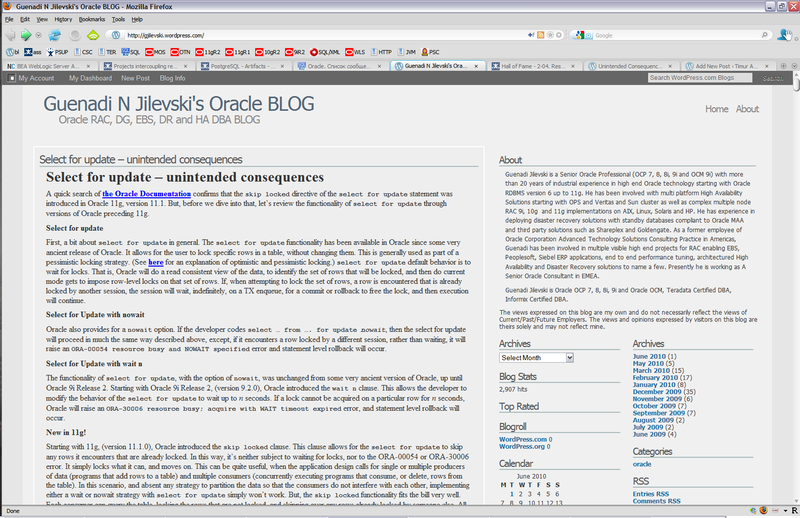 My personal conclusion is that the owner of the blog (which I presume is you) has removed the articles already – based on Google Cache content (just search for “Guenadi N Jilevski’s Oracle BLOG Oracle 11gR2 Grid Infrastructure — Memory Footprint”), I can clearly see that my blog post is pretty much reproduced one to one except few minor edits. I could assume that something happened by accident and that’s why I’m sending this message. However, to be honest, I can’t find any explanation to it. I will post this messages exchange in the comments on that blog that pointed. I suggest you provide the feedback there — otherwise, it can’t be explained by the readers. I do not understand. I do really admire your Oracle expertize and knowledge but I am surprised that some people are policing and have time to do so. That is a serious unsubstantiated accusation. I find this extremely very much intended to undermine my reputation. Please have the people post content that they do not want to be used. Seems like some of content of your blog is plagiarized including some of mine. Is it something that had a reasonable explanation? Thanks. I’ve updated my post – correction and screen shots. thank you for another bunch of links. I know Guenadi Jilevski and I have contacted him to address this issue. I have asked him to credit the sources of the material to avoid any plagiarism issues. I would have given you a credit if the posts exists. it would be great if you explain this situation: why did you do this? PS. I already asked you the same question in the comments in your blog before publishing my post. My comment was removed. In my posts, I have actual screenshots of my own personal domain name servers that do not exist in the original source from which I am accused of stealing content from. This proves that my work is original because I have my own personal Oracle database systems that show the content in the screen shots. For instance, I cannot simply do a cut and paste into an image unless I have performed the actual installation and configuration as my own work. This also applies for the rest of the content without images. References to Oracle documentation and third party sources will be verified and credited to comply with international copyright laws. If anyone has a dispute that contests the nature of my posts and believes it to infringe on copyright law, please email me at your convenience. Otherwise, I will assume by your tacit acquiescence that I am not in violation of copyright laws. If anyone believes that my blog posts contain content that has not been credited, please contact me so I can rectify the situation. Copyright ownership is immediate, and does not need to be registered for entitlement. It is absolutely not the responsibility of people to tell you not to post their work. It is your responsibility to obtain the permission of the copyright holder to post material that is owned by the copyright holders, whether it is pictures, large sections of text, or scripts. Consider this – you have spent tens of hours, hundreds of hours, or thousands of hours to produce something in written form, a book for instance. You have carefully specified every word on the page to state exactly what needs to be stated to clearly communicate a concept. You have spent hours building and testing scripts, verifying the results across different Oracle releases and different hardware platforms. A technical reviewer and an editor have reviewed your work, and you have made significant modifications to that work to more clearly communicate concepts that cannot be found through other resources. You assemble the scripts into an easily used format, and then you publish your work. Now, someone finds all of your hard work, thinks it looks impressive, runs your test scripts through their system, captures a bit of the output, changes a couple words in the text, and then publishes the material (possibly for profit) as their own hard work. By reproducing the hard work of others and publishing it as their own original content, they are robbing the original producers of that content, not only of their entitlement under copyright law, but also of all of their hard work and potential monetary benefit that may be derived from that work. That is exactly what you are doing by posting the original works of others with just a couple of changed words. This is not a serious unsubstantiated accusation – by posting the works of others as your own you are undermining your own reputation. That is what made your comment the quote of the day. I don’t have time nor desire to scout your blog identifying content that’s been taken from others. I didn’t even ask to take it off or provide a reference as I couldn’t care less, frankly. I reached out to you without any requests and accusations but out of curiosity of why that happened and I did emphasize that they might be a good explanation that I can’t see from your responses. I’ve gone way too far into this that I ever needed or wanted so I don’t think I will come back to commenting after this reply. From my perspective, you have fundamental misunderstanding of not only copyright law as Charles mentioned but, more important, professional ethics. I do see that you posted material of other with some *non-substantial* changes without even referencing the originals, not even talking about seeking the permission. Fact. What I also see is that your compromised posts have silently disappeared from you blog. Though, Internet is such a thing that once you write something in public, it’s very difficult to hide it. Fact. Finally, I see is that you are not convinced that something has been done fundamentally wrong in the first place. I don’t want to tell you what you should do but your response doesn’t score you any points. This is not fact but my perception. I have my own opinion on what happened and I leave it to the readers to judge on their own. My first message to you was a chance to recover your reputation. I think you blew it but again, it’s just my opinion. To make matters worse, the plagiarized content was ranking higher and coming as 1st hit. After my friend reported this, I immediately posted a comment on Jilevski’s blog to remove the content or give due credit. Thankfully, the post was removed immediately. I would assume that we all blog and publish technical papers with a sole purpose to share the knowledge which we acquire after adequate research and testing. If someone finds it useful and wants to share with a wider audience, he can reuse it after giving due credits or simply retweet or share it on buzz/faceboook. This is very unprofessional of the owner of the blog, I am deeply disappointed. One would have expected better. My content seems to have disappeared from the blog in question. I can only advise anyone to complain to wordpress to have content removed. I found more stuff from Tim Hall and Arup Nanda – it’s quite easy to identify the fake through timestamps or device names. Timur: Thanks for highlighting this. Note. Stealing the content, the puting a link to the original is still theft. Read the US and European Copyright laws and you will see that crediting a person does not prevent you from being prosecuted. I advise anyone to actually follow the process. First log a complaint on the blog post. If this doesn’t work, contact wordpress and have them remove the post. 1) Add a comment here, linking to the article in question. 2) Take a copy of “his” stolen article (get it from Google Cache if necessary). It’s always worth having evidence in case he removes the article then tries to take legal action for defamation of character. 3) Post a blog comment on his stolen article telling him to remove it. PS. Timur: Once again thankyou for bringing this to our attention. It is unfortunate that Guenadi does not understand copyright and fair use laws with respect to content published on blogs and other media. I have asked him to apologize for this wrongful behavior. I am saddened to see this sort of thing happen. Ben: I’m sorry you’ve been caught in the crossfire over this. Everyone realizes you are not part of this issue. Thanks for getting involved and helping to put things right. Not exactly an aid to credibility is it? I see that there is a list of Oracle Certified Masters at http://www.oracle.com/technology/ocm/ocm-10g.html and I’d advise Jivelski to get his name on that list, or people might question whether he is entitled to claim OCM status on his blog. Just to be sure, that is. It has been there earlier. I have contacted Guenadi personally hoping. That he would immediately recognize, apologize and removes everything and stop doing it. Unfortunately, he didn’t even admit any wrongdoing and all he did was removing compromised content cleaning up thoe traces. I believe that Guenadi has prosecuted himself – anybody who is looking for his name, will find number of blog posts about his behavior. Any descend hiring process will reject such candidate. Thanks for your support. It is unfortunate that I had to be involved and after the fact. Needless to say, I have ended any dealings with Jilveski. One more thing is that articles have been copied and its not a case where he subscribed to feed and it got auto published. I can say this as I had configured my feeds to show summary instead of full post. Either he aims to get more blog hits or wishes to bump his credentials while his book is being published. 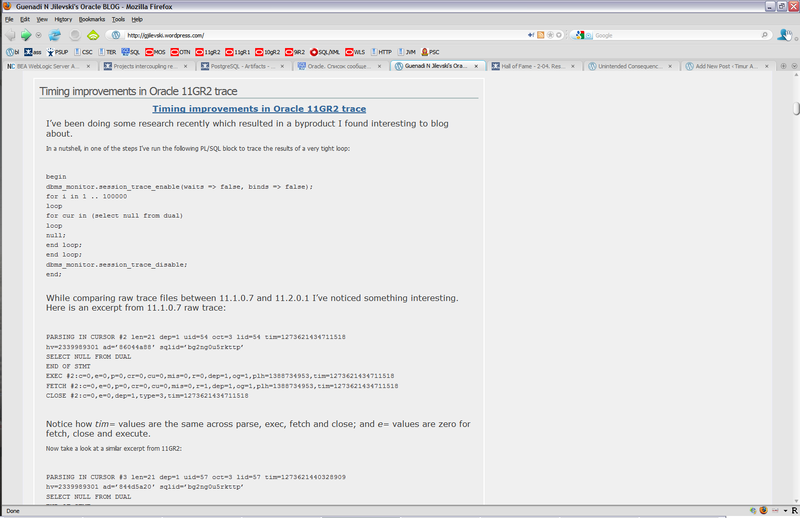 as anyone who checks his profile will think that he is a expert and contributed to oracle community immensely. Huh, probably he is watching too much Gerry Springfield?! Pardon my French. Sooner or later he will get sued and learn a hard lesson. Seems that you also changed your understanding …. Suffice it to say, one must acknowledge and credit sources for published materials unless it is one’s original material. I just want to clear the air on this matter once and for all. US and international copyright law applies to both web and printed media as well as recorded media. I make it a key point to reference sources of material in my blog and written papers and books. If you notice in my books, there is an exhausting reference section that details the many Oracle My Oracle Support (formerly Metalink) notes, technical papers and references for material I write. I have asked Guenadi Jilevski to please address this issue with all parties to make it correct if he has not credited sources of technical materials published. Stop trying to pick fault in others and just hold your hands up to what you’ve done. By constantly trying to defend your stance you just make the whole argument worse. The long and short of it is you’ve been stealing other people’s content and passing it off as your own. The very first post you ever put on your blog was an article you stole from me. There is no more discussion needed. – Remove any content you have stolen from your blog. – Remove derivative work that is on your blog. By that I mean articles that are almost entirely stolen, with a few modification made by you. – Keep your head down and let it all blow over. Everyone is entitled to make mistakes, but when you do it repeatedly for a couple of years, then make a fuss when you get found out you don’t endear yourself to anyone. Did you happen to know that OOW presentations are copyrighted by Oracle Corporation? Please do yourself a favor and remove the stolen post from the slideshare site! I reckon we should all make a formal complaint under DMCA. Removing a post ONLY on request by original author and then continuing to plagiarize doesn’t make any sense.